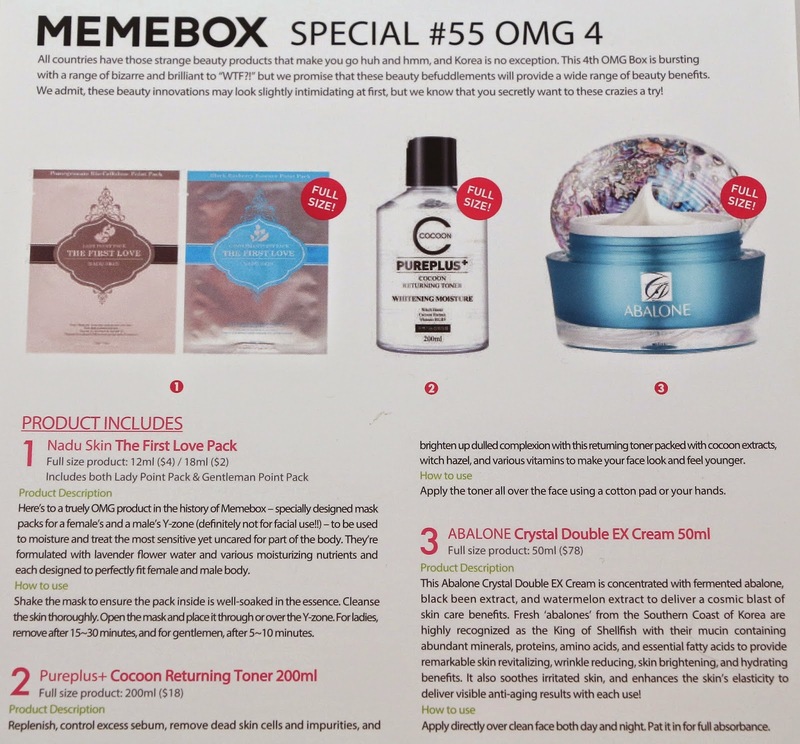 Wow, was the Memebox Special #55 OMG 4 a doozy of a box. We asked for more OMG, and I think we got it! Maybe just a tad too much OMG. I think somewhere in between what we had before, and this, would be a better amount of OMG factor. I purchased this box in an Express shipping bundle, so it shipped from Korea and was delivered by UPS 2 days later. 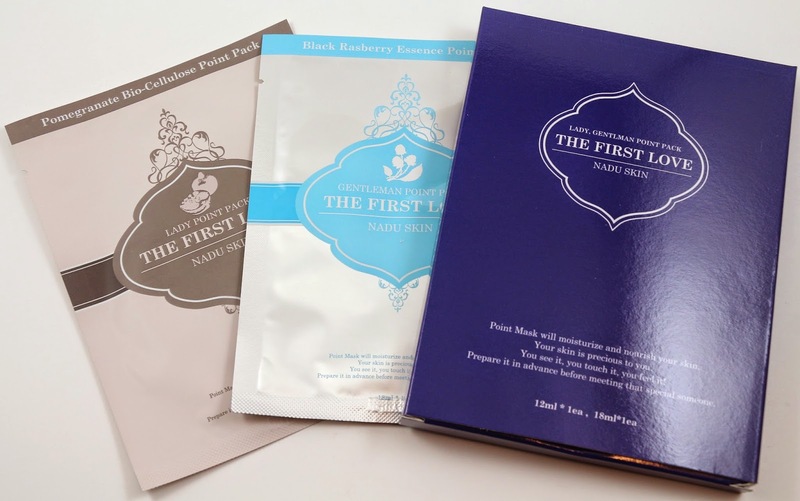 Product description: "Here's to a truly OMG product in the history of Memebox - specially designed mask packs for a female's and a male's Y-zone (definitely not for facial use!) - to be used to moisture and treat the most sensitive yet uncared for part of the body. They're formulated with lavender flower water and various moisturizing nutrients and each designed to perfectly fit female and male body." How to use: "Shake the mask to ensure the pack inside is well-soaked in the essence. Cleanse the skin thoroughly. Open the mask and place it through or over the Y-zone. For ladies remove after 15-30 minutes, and for gentlemen, after 5-10 minutes." My thoughts: ...I...what is there even to say about this? I don't know if there's anyone who receives this product who would actually use it, because there's no way I would. I actually gave it to a friend as a gag gift because she thought it was hilarious. 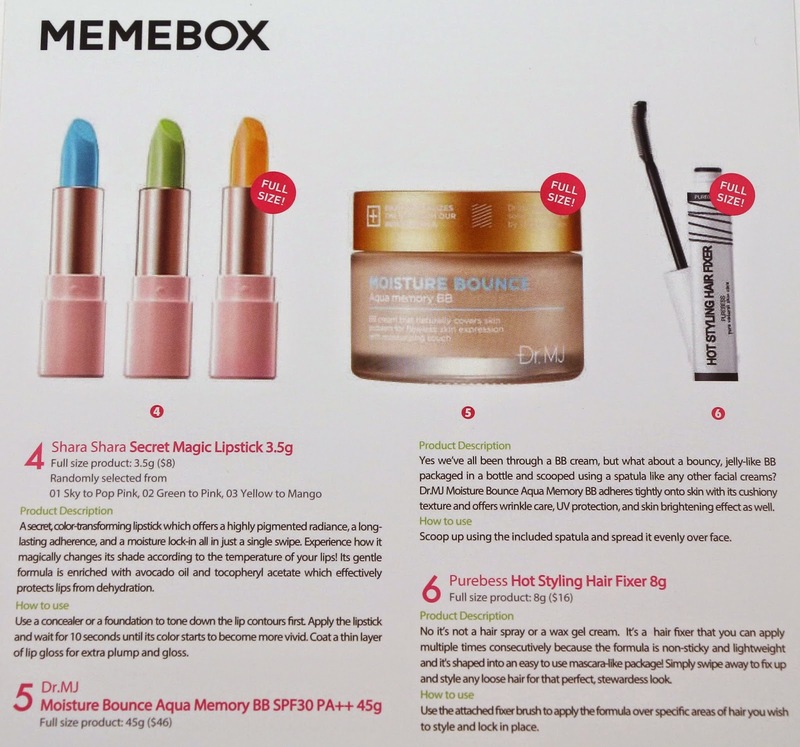 So, no Memebox, this is not what we had in mind for OMG, because it's something that probably no one is going to use. 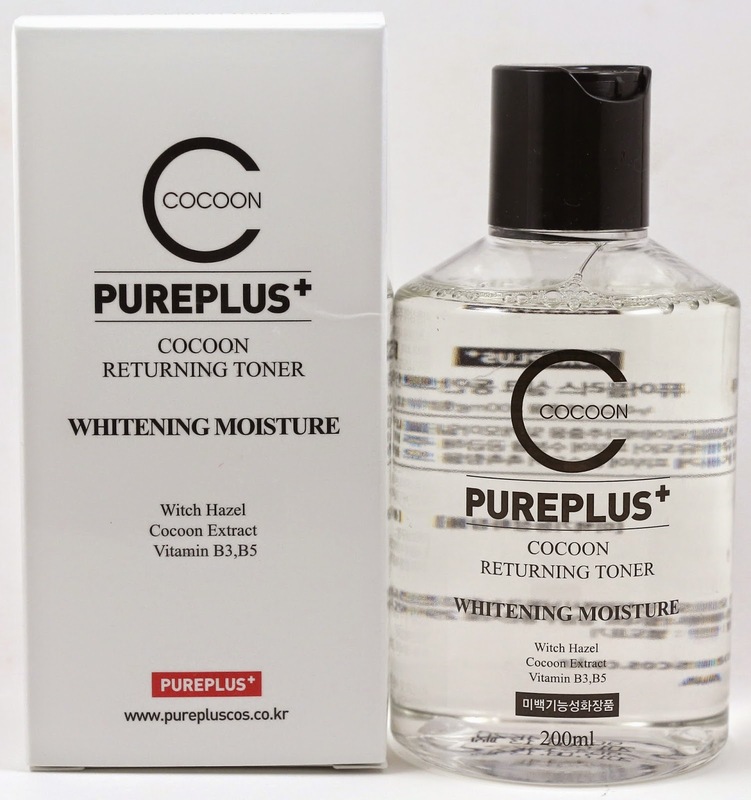 Product description: "Replenish, control excess sebum, remove dead skin cells and impurities, and brighten up dulled complexion with this returning toner packed with cocoon extracts, witch hazel, and various vitamins to make your face look and feel younger." How to use: "Apply the toner all over the face using a cotton pad or your hands." My thoughts: I really like toners, and I've always wished Memebox put more of them in boxes, so a cocoon one I'm interested to try. And this one is pretty hefty too, so it's a good size. Product description: "This Abalone Crystal Double EX Cream is concentrated with fermented abalone, black bean extract, and watermelon extract to deliver a cosmic blast of skin care benefits. Fresh 'abalones' from the Southern Coast of Korea are highly recognized as the King of Shellfish with their mucin containing abundant minerals, proteins, amino acids, and essential fatty acids to provide remarkable skin revitalizing, wrinkle reducing, skin brightening, and hydrating benefits. It also soothes irritated skin, and enhances the skin's elasticity to deliver visible anti-aging results with each use!" How to use: "Apply directly over clean face both day and night. Pat in for full absorbance." My thoughts: This product is obviously high quality and I'm really interested to use it. But it's a little strange for me, because abalone are endangered in California, they were over harvested years ago, so it's a little strange to see it as an ingredient in a beauty product. I don't know of their status in other parts of the world, but I would hate to know that they were being harvested for a beauty product, when their numbers are low elsewhere too. Product description: "A secret, color-transforming lipstick which offers a highly pigmented radiance, a long lasting adherence, and a moisture lock-in all in just a single swipe. 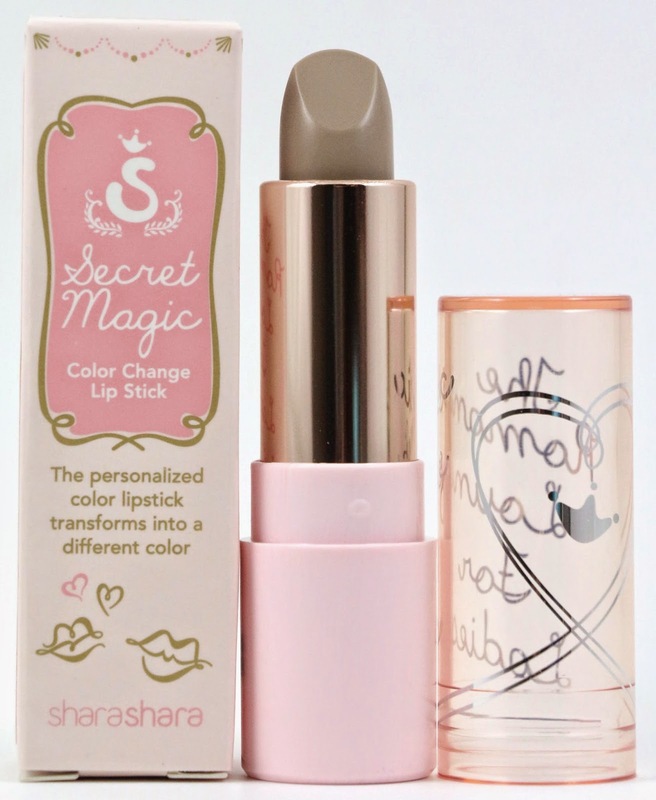 Experience how it magically changes its shade according to the temperature of your lips! Its gentle formula is enriched with avocado oil and tocopheryl acetate which effectively protects lips from dehydration." How to use: "Use a concealer or a foundation to tone down the lip contours first. Apply the lipstick and wait for 10 seconds until its color starts to become more vivid. Coat a thin layer of lip gloss for extra plump and gloss." My thoughts: Mine is supposed to be green, but it doesn't look green, it looks gross. I heard other people had the same problem, and after an adjustment in temperature it went back to what it was supposed to be, but mine never did. It still looks like this. 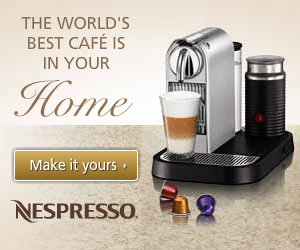 I know nothing is wrong with it per se, but I don't really want to try it. It's fun as a novelty item, but I wouldn't want to use this as my lipstick. Product description: "Yes, we've all been through a BB cream, but what about a bouncy, jelly-like BB cream packaged in a bottle and scooped using a spatula like any other facial creams? 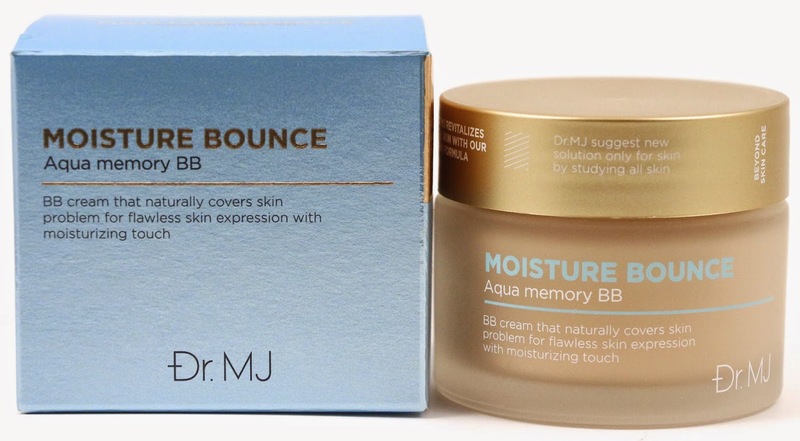 Dr. MJ Moisture Bounce Aqua Memory BB adheres tightly onto skin with its cushiony texture and offers wrinkle care, UV protection, and skin brightening effect as well." How to use: "Scoop up using the included spatula and spread it evenly over face." My thoughts: I am interested in trying this as I probably prefer BB creams over a heavy coverage foundation. But I don't like my skincare products in a jar, it's very unsanitary. I'll see if the color will work for my skin, but it looks a little too yellow for my skin tone. Product description: "No it's not a hair spray or a wax gel cream. 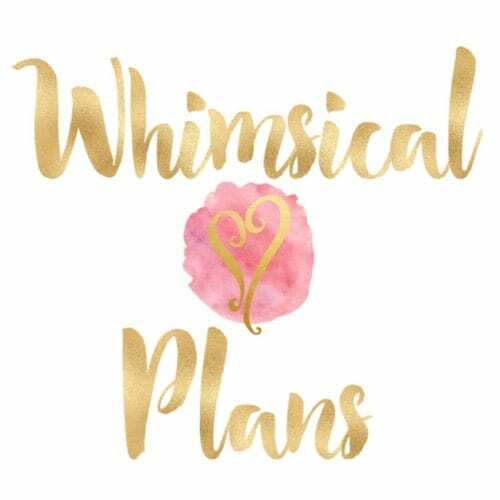 It's a hair fixer that you can apply multiple times consecutively because the formula is non-sticky and lightweight and it's shaped into an easy to use mascara-like package! 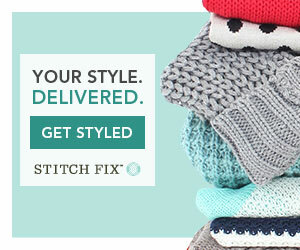 Simply swipe away to fix up and style any loose hair for that perfect, stewardess look." How to use: "Use the attached fixer brush to apply the formula over specific areas of hair you wish to style and lock in place." My thoughts: I probably could have used this a few years ago when I had this one hair near my hairline that would just not sit flat like the rest of my hair. Looked like it wanted to be wavy, when the rest of my hair is straight. But it's grown out now, and I just can't imagine needing this. Actually B might be able to use it, he sometimes get the hairs on the back of his head that dry a funny way if he didn't dry them properly. But I doubt I could get him to use this, when water works just as well to fix the problem. Overall, the Special #55 OMG 4 box had a total value of $172, which is quite a high value for recent boxes. It definitely helps that the high value items are things I want to use, but the masks are weird. So weird. The lipstick is poor quality and I don't want to use it, and I probably have no use for the hair product. 3/6 that I want to use. Which is ok, considering I got this in a bundle, it arrived quickly, and I got a major discount on it. I got one of these too. I agree about the three products you won't use. I also got the green lipstick and it was discoloured and never went back to the original. I have been using the toner and it is wonderful, and I decanted the BB cream into a more hygenic pump bottle and I actually really like it. 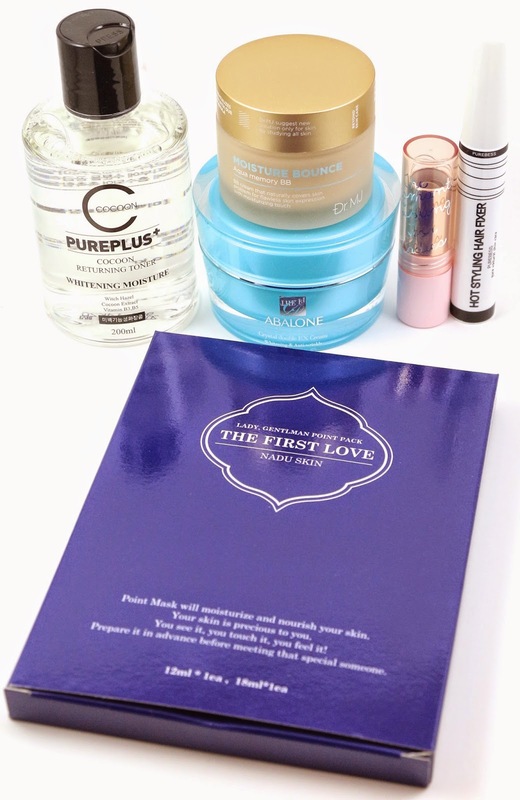 I have yet to try the Abalone cream, but I am looking forward to it. Thanks for the review, I enjoyed reading it!